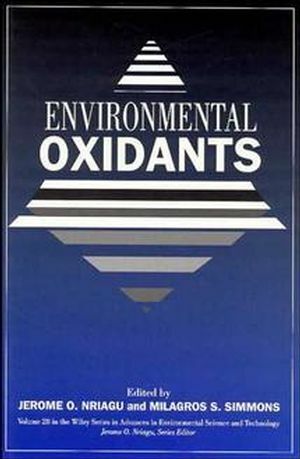 A selective and incisive look at the current state of research onoxidants, Environmental Oxidants provides environmental scientistsand engineers with an informative, detailed discussion of just howand why oxidants have emerged as a key issue in human health andenvironmental integrity. About the editors JEROME O. NRIAGU is a professor in the Department of Environmental and Industrial Health, School of Public Health, the University of Michigan, and an adjunct professor at the University of Waterloo. For many years he was a research scientist with the National Water Research Institute, Burlington, Ontario. He is the editor of the Wiley Series in Advances in Environmental Science and Technology and has edited, among many other volumes, Nickel and Human Health, Food Contamination from Environmental Sources, Gaseous Pollutants, and Aquatic Toxicology. Dr. Nriagu received BSc and DSc degrees from the University of Ibadan, Nigeria, an MS from the University of Wisconsin, Madison, and a PhD in geochemistry from the University of Toronto. He has published extensively in leading geochemical and environmental science journals and has received a number of awards for his work. He is Fellow of the Royal Society of Canada. MILAGROS S. SIMMONS is a professor in the Department of Environmental and Industrial Health, School of Public Health, the University of Michigan, and an associate research chemist at the Center for Great Lakes Research at the University of Michigan. She is a coeditor of Food Contamination from Environmental Sources and Toxic Contaminants in the Great Lakes. She is a member of the American Chemical Society, Inter: American Chemical Society, Inter: American Photochemical Society, and the Society of Toxicology and Environmental Chemistry. Dr. Simmons received her BSc in chemistry from the University of Santo Tomas in Manila, the Philippines, and her MS and PhD in chemistry from Wayne State University. She has published extensively in the area of environmental photochemistry, the fate and effects of organic pollutants, and environmental analytical chemistry. Photosynthetic Oxygen Evolution (C. Yocum). Oxidants in the Unpolluted Marine Atmosphere (A. Thompson). Ozone Formation in Urban Plumes (I. Colbeck & A.MacKenzie). The Impact of Dynamics and Transport on Stratospheric Ozone andOther Constituents (J. Austin). Aqueous Sulfur(IV) Oxidation Revisited (L. Martin). Oxidative Mechanisms of Phototoxity (R. Larson & K.Marley). Effects of Ozone in Human Studies (N. Alexis, et al.). Some Hematological Effects of Oxidants (O. Baskurt & S.Yavuzer). Impact of Oxidants on a Forest Area Assessed with Dynamic Maps (W.Grossmann). Alternative Attainment Criteria for a Secondary Federal Standardfor Ozone (E. Lee, et al. ).